On 26th August 2014, the 8th anniversary of the Phulbari Mass uprising has been observed countrywide with the following slogan: ‘There is no place for the betrayers on the streets of Phulbari drenched with the blood of our martyrs’. 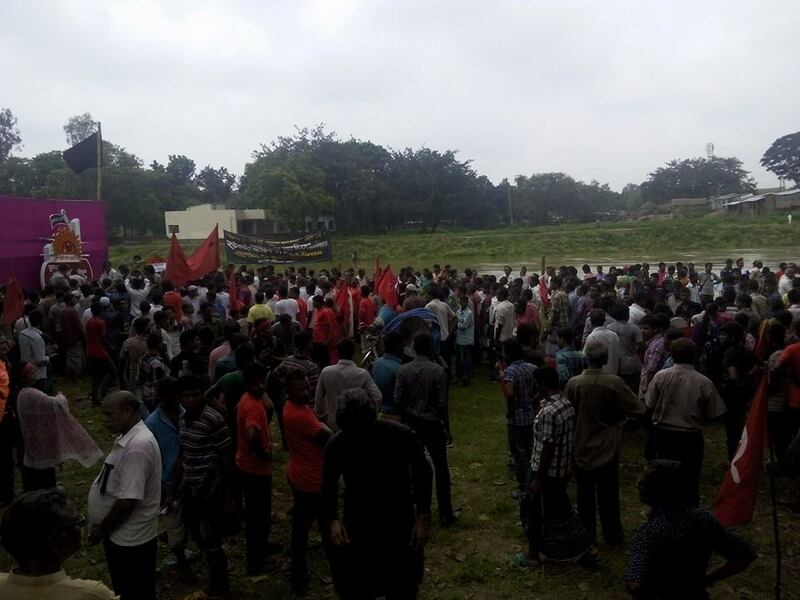 Daylong programmes were observed in Phulbari that included mourning procession, wearing black badge, hoisting black flag, rally and cultural activities of resistance. The day’s programme started at 7 am with placing respect to the Martyrs and wearing of black badges. In remembrance of the martyrs and their sacrifice all shops and businesses were closed that day. Black flags were hoisted in many places. Moving the office of Asia Energy from their town. Activities around opening up of Boro Pukuria was condemned. Member secretary of the National Committee Prof Anu Muhammad delivered the welcome address, convener of national committee Engineer Sheikh Shahidullah spoke about the demands, and Saiful Islam Jewel presided the meeting. Leaders of Jatyo Ganofront, Bangladesh Communist Party, Bangladesh Socialist Party, Bangladesh Workers party, Revolutionary workers’ party, BaSoD convention preparation committee, Democratic Revolutionary party, Gano Shonghoti Andolon, United Communist League, leaders of Phulbari Branch of the national committee spoke in the occasion. Many other local, regional political organization, individuals including Bablu Roy (person injured by the Rana plaza disaster) and university teacher were also present in the program. In the rally, the speakers remembered the day in 2006 to emphasize how remarkably people of Phulbari defied law enforcers, attended the rally in thousands a nd after the murder of the three, people here mounted one of the greatest resistance in Bangladesh against the company. As a result, on the 30 August 2006, the then government was forced to sign an accord with the protestors of the company that said there will be no open pit mine and Asia Energy would have to leave. The current Prime minister promised Phulbari people that she would never let this mine start. However, surprisingly, with the same person now as the head of State, we have not seen a transparent step to ban Asia energy. 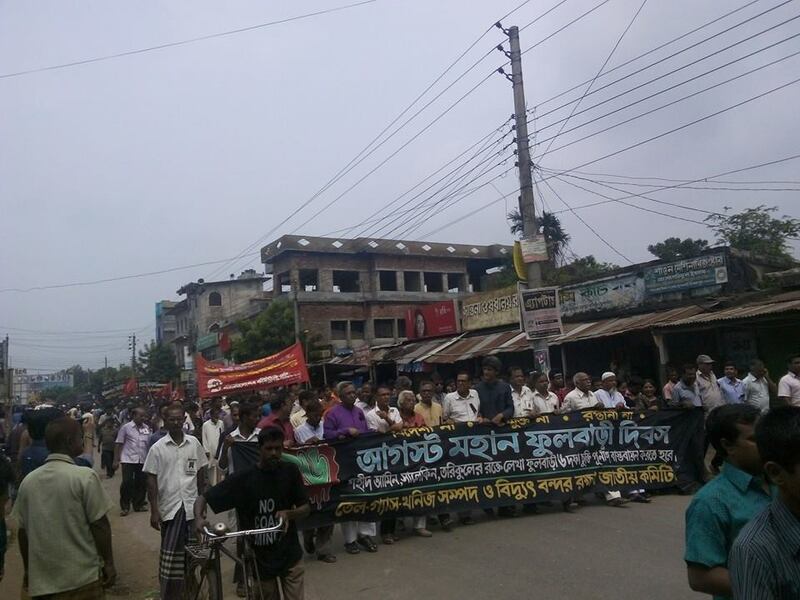 The rally demanded the full implementation of The Phulbari accord by the 30th November. Failure to do so will incur a huge rally of people on the 1st December. In the afternoon, resistance songs and plays were performed. In the evening, film shows titled, ‘We don’t want a mine’, ‘Fulbari – a Blood flag’ and Indian documentary named ‘Fulbari debona’ were screened. This entry was posted in National Committee of Bangladesh, National Contact Point UK, News, Phulbari. Bookmark the permalink.